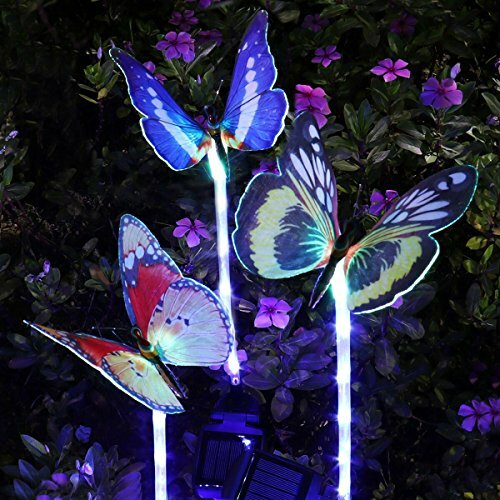 【UNIQUE DESIGNED SOLAR YARD DECORATION】 - 30 inch tall, 3 pack RGB color changing solar powered fiber optic butterfly(no LED in butterfly) garden stake lights, with 5 purple LED in each transparent stake which has fabulous light effect. 【SOLAR POWERED & EFFICIENT LIGHTING】 - Built-in solar panel automatically recharges during the day, these outdoor solar lights charge up with as little as 4 to 5 hours of sun, and then provide 6 to 8 hours of light, illuminate your garden and pathway. 【USER FRIENDLY & SIMPLE INSTALLATION】 - Just press into the ground wherever you want a beautiful illuminated decoration. The outdoor butterfly lights come with open wings, save your time to spread them strongly and carefully. No wiring or batteries to replace; uses free solar power. 【LIGHT SENSORED & AUTO ON OFF】 - The led garden light stake light up automatically when it's dark and turn off in daylight(Turn on the switch at first use). Perfect for outdoor decoration, you can use these led butterfly decoration in almost any outdoor space. 【RELIABLE 1-YEAR MONEY-BACK GUARANTEE】 - IP65 waterproof class, Ideal as yard decor, solar led lights outdoor, butterflies garden decor, butterfly outdoor decor, outdoor decorations lights. Their colorful glow can outline a path, front walk, or driveway. If you're unsatisfied with this item for any reason, we'll immediately refund your purchase price.